French crepes anyone ? Who is better than me, a French girl born and raise in France to share the authentic French crepes recipe, right? That is the Authentic french crepes recipe as you will eat in Paris. You guys know I am French right? So after a year of blogging it maybe the time to share my easy and healthy traditional french crepes recipe. Each year on the 2nd February, it is what French people call ‘La Chandeleur’ or the day when a whole country eat crepes! It is a tradition and most French family will be eating french crepes for the occasion. Don’t ask me why – I am actually not to sure about the story – all I know we eat crepes! Even since I moved in New Zealand we make crepes on that day. The tradition says that we must eat them only after 8 pm. Well, nobody wait up to that time, trust me everyone starts eating them at breakfast. So now, you probably want to know what is exactly is an Authentic French crepe recipe, right? Well, there is actually two authentic french crepes recipes depending on the filling you are going to use. It is a pretty easy crepe batter made of milk, eggs and white wheat flour and most often flavored with vanilla extract or orange blossom flower water. Personally, I love orange blossom flower water but it is super hard to find it in New Zealand so I am using vanilla extract since I moved here. 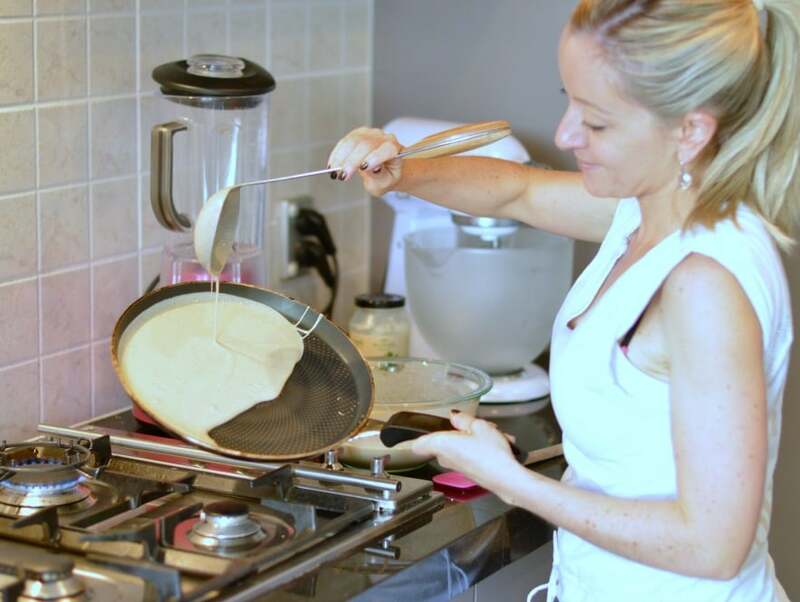 I know it is not the healthier recipe in the world but if you want my healthy french crepe recipe made of nut flour – yep, it is a gluten free french crepes recipe – check out my Low Carb Almond Flour Crepe recipe. So what is the trick to make a perfect french crepe ? It is to pour the batter on a very hot pan while tipping the pan – as you see me on the picture below. That is how you make a thin and crispy crepes. The one you will eat in France. That is all you need to know to make the best french crepe. Remember that french loves eating crepes as a social thing. We do crepes party with friends and family very often. We eat crepes anytime for afternoon tea, birthdays, breakfast but always with many friends or family members. It is a fun time where anyone will design its own favorite crepe using the toppings he loves. The most favorite french crepes toppings are not healthy at all ! It is icing sugar, jam, honey or the most popular is Nutella chocolate hazelnut spread. Check out my sugar free nutella recipe for a healthier alternative. Finally, remember that most French people roll their crepes to eat them with their finger. It is only in the restaurant that they fold them in a triangle. Here we go! you know everything about french crepes now ! Don’t hesitate to ask me more by leaving a comment! I will love to help you design your best crepes party ! WATCH MY FRENCH CREPE VIDEO AND MAKE IT NOW ! 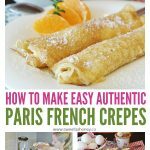 Authentic french crepes recipe as you will eat in Paris. French crepes are thin, crispy on sides and filled with delicious sweet jam or chocolate spread. In a large bowl add the flour, eggs, salt, vanilla extract, melted butter and sugar if used. Using a whisk or electric mixer, beat in the milk gradually until a smooth batter form with no lumps. Crepe pan: I am using a 10 inches French crepes pan. It makes 12 perfectly thin and crispy french crepes with this recipe. You can find my crepe pan here. Store: you can cook all the crepes then store them in the fridge, on a plate covered with plastic wrap. It store well up to 2 days. Filling ideas: jam, chocolate spread, honey, maple syrup, apple compote, fruits, nut butters, whipped cream, ice cream, nuts, coconut and more! Finally a French crepes recipe that comes out great ! THANKS! Wow Carine ! Those are the best French crepes recipe I ever made! Super easy and delicious. Merci! Sara. Sooo GOOD, thanks for sharing. These are amazing! 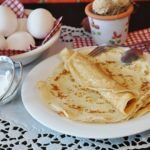 I’ve tried many crepe recipes and these are the best! The recipe is much easier to flip then most crepe recipes and not one of my crepes was a fail! Thank you for sharing such an awesome recipe! Bonjour ! Thank you SO much for this lovely comment. I am French and it is the original french crepes recipe I grow up with. The one my French grandma and French mum made for my afternoon tea as a kid. It makes me so happy that you love this simple and delicious recipe. It means so much to me ! Thanks for reading my blog and testing my recipes. xoxo Carine. Made these for mother’s day! Big hit!!! Happy Mother’s day to your mum! I am so happy you both enjoy the crepes. Thanks for sharing your beautiful comment. XOXO Carine. Awesome David ! Blueberries are great in crepes, enjoy them and let me know how it goes! XOXO Carine. Found this on Pinterest. Made them and they were super easy to make and wonderfully delicious!!!! WOW Carine, those are the best crepes recipe I ever made form US. I have been in Paris long time ao and those taste the same as the authentic French crepes I had there! Merci beaucoup. Love, Sam. love love love this recipe, made millions times and always a success ! Sure, any milk will work. Enjoy the crepes! xoxo Carine. Thanks for sharing this lovely recipe. We are British and love French recipes. Those crepes really taste great, the bets recipe I made for few years and super easy. I can’t wait to make it again. You are so mice, thanks for this lovely comment. I am so happy when people take few minutes to share a positive comment about my recipe <3 xoxo Carine. Thanks for the lovely comment ! I am happy you loved them 🙂 Thanks for reading the blog and making my recipes XOXO Carine. Please tell me,can I use whole wheat flour instead of all purpose flour? Sure you can but you may need to adjust your milk amount – add a bit more to reach the same dough consistency. Wholewheat contain more fibre that soak up liquid. The batter will be thicker and more difficult to cook in the crepe pan. Enjoy, XOXO Carine. Can I premake batter the night before and store it in the fridge until ready to use in the morning? Sure ! It won’t be a problem but make sure you store the batter in a plastic airtight container. My mum was doing that all the time as a kid, works perfectly. In the morning, give a good stir in the batter, see if it is thicker, it shouldn’t be if it is add few tablespoon extra milk. Cook as usual, you won’t see the difference. Also, you can pre cook all your crepes the day before, store in the fridge on a plate covered with plastic wrap and rewarm in the pan in the morning. 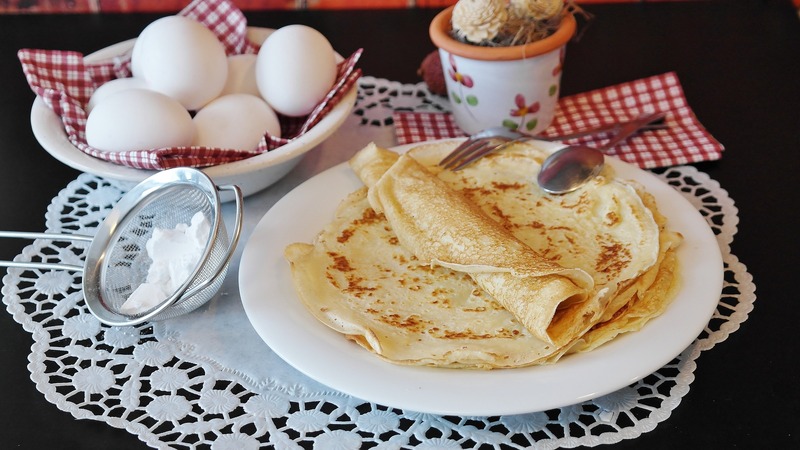 Enjoy the french crepes recipe. A bientot! Carine. First timer, breakfast on Valentine’s Day, huge hit with the wife. Thank you so much. What a beautiful comment <3 I send you both lots of love! Thanks for trying my recipes. XOXO. Carine. Awesome sugar free idea! Love it !!! Thanks for sharing here. XOXO Carine. What if you don’t have a crepe pan. Hi, You can cook this batter in any non stick frying pan, the same that you will use for a pancake recipe. Enjoy! XOXO Carine. You need about 1/3 cup of batter but you can prepare 1/2 cup, pour it gradually while you tilt the pan and stop when it is fully covered and the desired thickness. 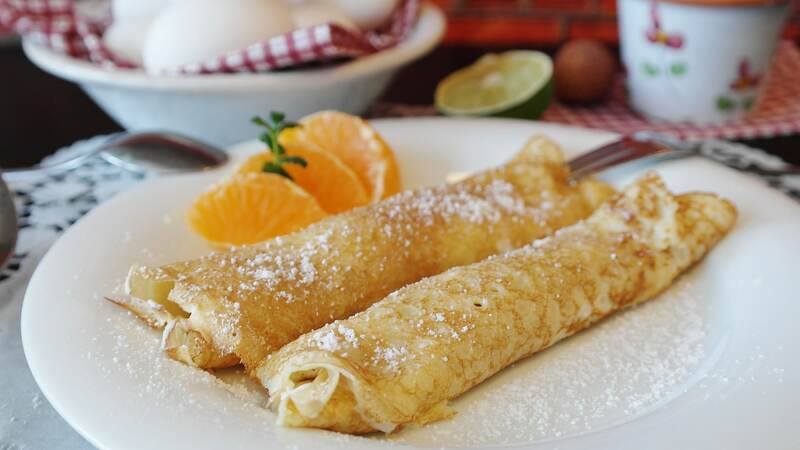 Like for pancakes, crepes can be thin or thicker, depending on taste. Both works well, it is just longer to cook if thicker. You know it is ready when the border are crispy and lift from the crepe pan by itself. Enjoy ! XOXO Carine. Can I make the batter the night before so it’s ready to cook in the morning? Yes you can. My mum always did that when I was a kid. It works perfectly. Enjoy the crepes. XOXO Carine. My mother is allergic to wheat and a bunch of other things and possibly coconut. I wanted to know if you knew any good recipes without wheat in them, I trust this recipe so I would trust your judgment on what other good recipes there are without wheat. Sure! I have got plenty of wheat free crepes recipe on my blog. 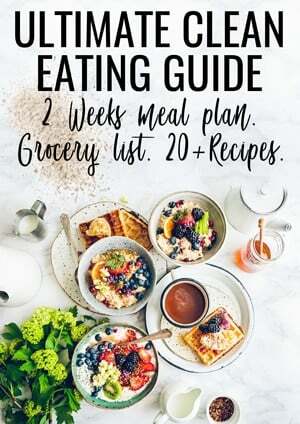 You can try the almond flour crepes, the chickpea flour crepes ( egg free too), the coconut flour crepes or the buckwheat flour crepes – egg free too. All of those crepes recipes are gluten free, wheat free (buckwheat is wheat free, yes) and some are egg free as well. If you said she might be allergic to coonut probably don’t make the coconut flour one of course ! Enjoy all the crepes recipes on the blog. Love to you and your mother. XOXO Carine. That made my day! I love when my recipes makes people happy 🙂 Enjoy all the crepes recipes on the blog I have got plenty of healthier options too like chickpea flour crepes or buckwheat flour crepes! Delicious with savory fillings too. XOXO Carine. Thank you for this recipe, this is soooo goood! Amazing! I am so happy you love them 🙂 Enjoy the blog recipes. XOXO Carine. I am allergic to eggs and I’ve been looking for a recipe that works well with an egg substitute for a long time and this recipe is the one! Taste great and perfect with both sweet and savoury fillings! I am so glad to hear that! Otherwise I also have an egg free crepe recipe if you like ! Enjoy the recipes on the blog 🙂 Carine. Just like the ones I had in Rouen!! They are so good! Thank you for sharing your recipe! It is like being in France again!! My pleasure! I love Rouen, such a beautiful city. Enjoy the recipes on the blog. XOXO Carine. Thank you for sharing this recipe. My granddaughter loves for me to make these whenever she spends the night. We make homemade lemon curd for the rilling and top with fresh whipped cream and fresh strawberries. That is her favorite. When we can’t get fresh fruit, we make a simple compote. So delicious. What a lovely story! I love the filling you re using for those crepes, lemon curd is SO good! Thanks so much for sharing with me. XOXO Carine. My pleasure I am so glad you enjoy the crepes. XOXO Carine. I’m very curious to find out how your recipe would change with orange blossom instead of the vanilla extract as I’m very eager to try it out with orange blossom water. These were amazing by the way. I do use orange blossom sometime too, 1 or 2 teaspoon in the crepe batter is amazing! I highly recommend you try. Enjoy the blog recipes and thanks so much for trying some. XOXO Carine. It is simply because your milk is too cold. Flour always makes lumps if you combine it to cold milk. Two thing, add milk lukewarm (think bath temperature), you can microwave for 30 seconds-1 min before adding to the batter.Also, adding milk gradually avoid lumps. Note that every French has lumps in their french crepes batter so you are not doing it wrong! 🙂 It is ok you don’t feel them ! Enjoy the recipes on the blog and thanks for trying some with your kids. XOXO Carine. Best crepes ever!!!!!!!!!!!!!,!!!!!!!!!!!!!!!!!!!!!!!,!!!,,,! I ate a melted cheese one it was awesomesause!!! Awesome ! thanks for trying my recipes and reporting back here. XOXO Carine. This makes me so happy because this is my mum recipe. I am French and I have been born and raised eating those crepes. I am so glad to share it now with you and that everyone can enoy a bit of my French culture where they are. Merci! Carine.